Nate McCoy isn't your ordinary private detective. Sure, he's a bit of a slacker who doesn't follow orders and loves to rattle the status quo's cages, but that's not what really sets him apart. After rattling the wrong cage, Nate took a bullet to his head that, somehow, didn't kill him. Instead, it gave him an unusual ability: He can see and interact with past versions of himself. The people he reincarnated from. With the help of Jameson (a Wild West lawman) and Alan (a Mad Men-era hitman), Nate sets his sights on taking down his city's crime kingpin and find out who he has to "thank" for the bullet that gave him this strange, and helpful, new power. The great premise is laid out slowly as we get to know Nate and the world he inhabits. Moreci's dialogue keeps things interesting before Nate's brush with death. By the end you'll be hooked and want to see this new arrangement between Nate and two of his previous incarnations solve the mystery. It's an engaging first issue that uses classic detective tropes and spins it on its head. Nate's a likable slacker who acquires new tools to do his job better. Keith Burns delivers great detail and efficient layouts. He adds a sense of energy with varied perspectives and great character designs. Chris Beckett's innovative color scheme brings some bold hues amid the shadows and the night. 'ReincarNATE' is just the type of creative storytelling that has made Moreci one the busiest writers in comics as well as successful getting his works adapted into film and TV. Burns and Beckett brings it all to life with wonderful designs and colors. 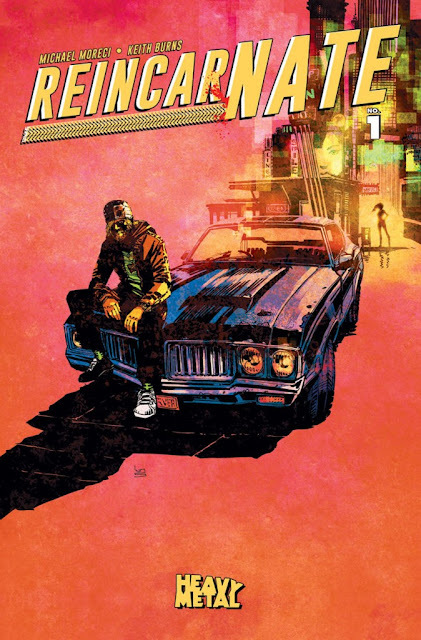 Thanks to Heavy Metal, readers get another chance to delve into 'ReincarNATE' and everyone should.